The girls and I marvel constantly at how Parisians don't seem to be in a hurry. They saunter, they stroll, they meander, while the three of us careen wildly like pinballs bouncing off the crowds as we rush places. Nowhere is this more evident than in the metro. As we approach the metro, we become weekend joggers. When we get past the ticket booth, we become track and fielders, and if we are near the stairs and hear a train pulling into the station, we run like Olympic sprinters to try to make it on time. Sometimes we make it in the nick of time, jumping onto the train just before the doors close. The doors close mercilessly here and so we have devised an emergency plan for the (inevitable?) time when either I am separated from the girls or one of them is separated from the rest of us. The plan is this: Whoever is stuck on the train -- either because they didn't get off quickly enough or were the only ones who made it on -- gets off at the next stop and waits in that same spot for the next train. There are not express/local trains to worry about. Those left behind get on the next train and catch up. Even if we have to go the wrong direction, or leave the station that is our actual destination, that's the plan. The girls seem pretty excited to lose me, but we'll see how they feel when it's the real McCoy. It has taken us a couple months of occasional metro riding to figure out why nobody else is rushing. Sometimes, we run down the stairs, "Aaaargh!!!!" only to find out we have just missed the train. In that case, we look up at the board and discover the next train is coming in 3, or 2 minutes. Sometimes, by the time we can stop panting and look up at the board, the next train has already arrived, and that's not an exaggeration; they sometimes come within 30 seconds of each other. There are so many trains, and they run so efficiently (well, unless there are strikes, demonstrations, bomb scares, or the rare "sick traveler" that closes a station), that it's almost -- almost -- Japanese. Perhaps our awe at the metro system is in direct reaction to riding the markedly-less efficient Muni buses in San Francisco. But now that we understand it, maybe we can slow down a bit. Unless we hear our train pulling in before we're ready on the track, that is. Originally from Bretagne, and also made in a large surrounding area including Basse-Normandie (Lower Normandy), Lorraine, and Nord-Pas-de-Calais (northern coast of France, along the Channel). 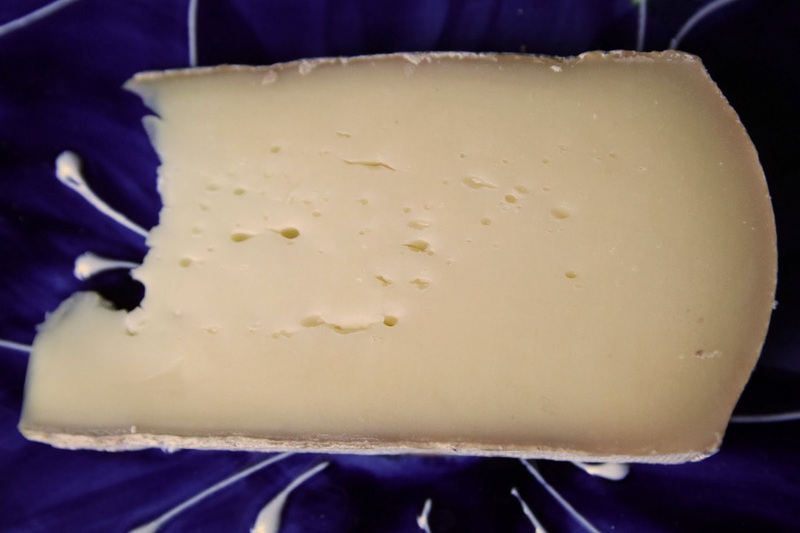 Saint Paulin is considered a more industrial version of Port-Salut, but having said that, the one I buy is a high-quality, farmhouse version from an elite cheese shop, Androuet. There is, however, a fully industrial version with the brand name of Saint-Paulin (hyphen definite in this case) that is produced both in France and Canada. 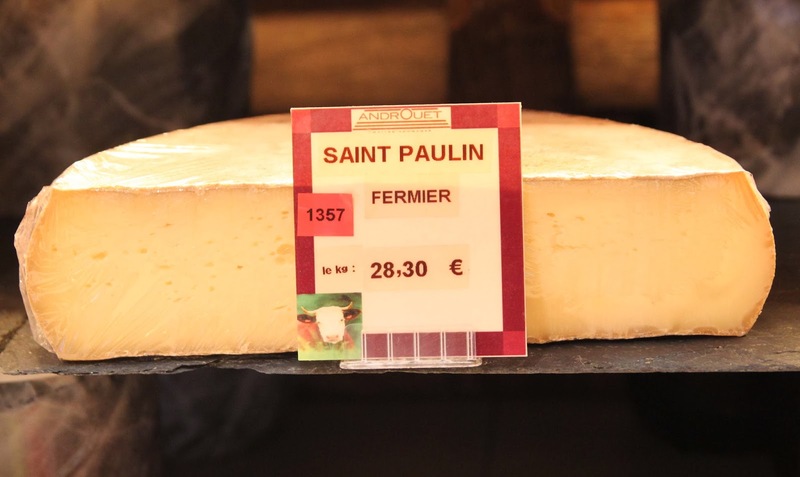 Saint-Paulin -- with or without the hyphen -- is also a generic term for this style of raw, uncooked, semi-hard cow's milk cheese. Any way you slice it, it's a cow's milk cheese, aged and washed in humid cellars for two months. But given the range of variations, it's almost a sure bet that the one you buy won't taste like the one I try. And, for that matter, neither will the next one I buy, especially if I get an industrial version from a supermarket. But given that it's an off-shoot of a Port-Salut, tasted both the Port-Salut and this farmhouse Saint Paulin, I think it's safe to describe this a medium-flavor, medium-texture cheese. That is to say, it's got a hint of stink, and a hint of acid, but mostly it's a mellow cow's cheese that won't shock the non-French palate. Texture-wise, it's not dry and crumbly, but it's also not creamy or oozy. It's safely in the middle: a slightly rubbery texture that melts in the mouth, but only if it's kept in the mouth and purposely melted there. I have been racking my brain for a cheese that would link with the metro theme; the only one I could think of was Saint Paulin, since one of the metro stations we use most is at Saint Paul. But I've been scouring stores for weeks for a Saint Paulin with no luck. Until today. I finally find one in an Androuet store in the 17th arrondissement. More amazingly, at the same store I find a cheese I've never heard of or read about called Saint Paul, so I buy both. As cheeses go, they couldn't be more different: this one a firm cow cheese, and the Saint Paul a small, creamy goat cheese. But I have another metro-related story to tell -- a part two to this story, if you will -- and now we both know what the cheese will be when I tell it.